I think you are right, that this is no answer but I don't much like your attitude about disaster relief. Some years ago, (1991) this whole community suffered a devastating hail storm that took in nearly the whole valley. Eventually, some disaster relief was available and used by the producers who qualified. In our case, it was the difference between staying in business or not. Now losing us would not have been a huge deal to the area but losing all the producers would have been a second disaster. I think the "relief" money actually did the banks and businesses as much good as the producers. Maybe we are beggers for taking that that was available but in the following years, we have gone on to prosper, pay far more taxes than the money we took, provide jobs for several people each year, buy equipment, borrow and pay back money paying interest, etc. etc. The story is the same for most of our neighbors. I'm not quite sure what you mean about my attitude towards disaster relief. I absolutely hate it when I see guys flying to Washington with their hat in hand saying how they are going to go out of business if they don't get disaster relief. Hell, with no disaster going on I can't afford to fly to Washington and beg for money, how can they if they are about ready to lose their place? Another example is the guy that drives his brand new big dually truck to the Farm Service Agency on a daily basis wondering if there is any kind of disaster or free money program to sign up for, they are going to go out of business without it they say. This is why I get a bad attitude about it. As I have said before, if offered, I take disaster relief. I would be stupid not to. Taking what is offered is not being a beggar, it's those that are spending their money like it has no end running around whining how their world is coming to an end if they don't get disaster relief that bother me. That's begging, and that's all you ever see when it comes to these situations. Not the people that are in true financial need that are hunkered down trying to make things work. Trying to make it work out is not begging. i cant find your last answer on the seed drill. (too long ago) could you tell me what model and brand seed drill you used on your alfalfa and wheatgrass. you told me it was your dads , so i assume it is old, which is o.k.& does it have the press wheels, thanks. PS: How big of a corporation are you? If it wasn't so sad it would be funny. Need I say more Sam. Sam, watch out! Big Brother is watching you and your blog, you must have struck a nerve. The very nerve of saying the 1.5 billion was used up by Tyson and you would have to wait until next year. What in the hell are you supposed to eat on and pay your bills with until next year. I didn't see any major media campout in the Bridger area to cover the loss and slaughter of two herds that took years to develop. I didn't see Al Sharpton and Jesse Jackson holding any rallies in front of the ranches and saying what an injustice this was. I didn't see FEMA or the Red Cross show up to provide disaster relief. I didn't see any big concerts by Bono and others to bring attention and raise funds for this disaster. The one thing that makes Montana and the people great is that we don't depend on the Government to take care of us, we take care of ourselves and help our neighbors. Sam, to quote John Wayne,"Damn the torpedoes, full speed ahead". The payment that the USDA makes for the cattle is not what the cattle that were killed are worth. Period. Nor was the payment in relief of the hail disaster any ways close to what the crops would have brought had they been raised to maturity and marketed as usual. But, the payment saved the producers of this valley to go on to another year and hopefully, the cattle payments will allow those producers to continue in the business. It takes many years to recover from something like that. In our case it was eight years until we were in the same financial position that we were in before the hail. It doesn't make you whole but it did give this community a chance to work itself out a bad bind. In those days, the disaster relief was a lot more timely than now. The worst thing about the Bridger mess beyond the losses to the individuals involved is that nothing is being done to keep the same thing from happening again. 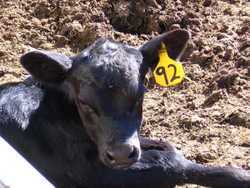 A calf trying to wake up from his nap in the sun. Taken 3/3/2006.